A glass reservoir – the pot. Its diameter is the same in all models, although they differ in capacity ranging from small (0.35 ml) to big (1 l). The capacity depends on the pot’s height: the higher it is, the more liquid you can pour in it. A metal or plastic holder, in which the pot is inserted. The lid features a compression bar with a plunger, which moves freely up and down the pot. This is the tool that actually does the compression. A circular filter mesh is attached to the plunger’s base. It has the same diameter as the pot. Drinks have a very different taste than drinks from a drip or a Turkish coffee maker. It is thinner and has no bitter streak. Instead, it smells and tastes like true coffee grains. Pressed coffee has minimum of caffeine, which is a crucial characteristic for some people. It has to be rinsed regularly. If you don’t, you will end up with a rotten smell, which is very hard to kill. Filters get clogged easily and therefore have to be replaced frequently. You must really know how to make it! It is absolutely imperative that you use fresh-roasted beans. Also, you may need a high quality electric grinder, which will make beans of fine grinding. Use only a burr grinder: a blade grinder will not work. 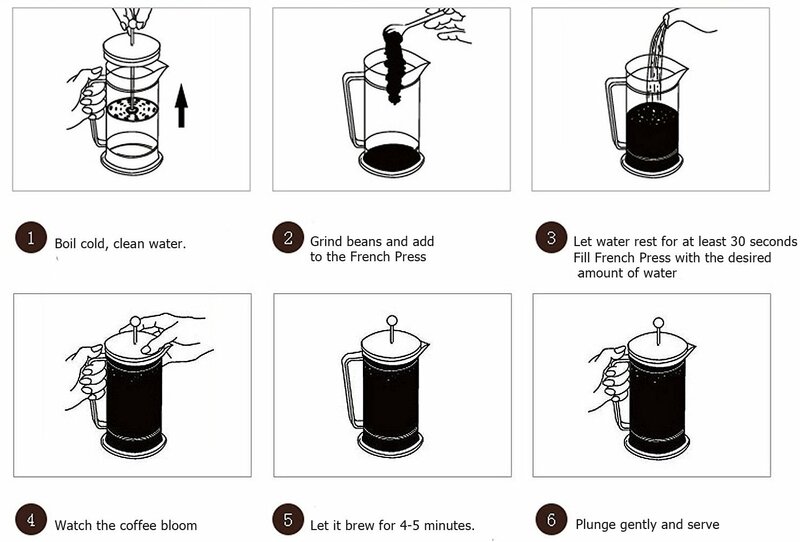 There are several things, which you should pay attention to when buying a French press: The price. It may differ greatly from model to model depending on the brand, materials, quality and design of parts. Usually, a French press coffee pot has a standard functionality. When choosing one, please, do not sacrifice quality for price. The type of glass and the pot’s position: being the most fragile element, the pot must be fixed in a metal holder. High quality pots are made of heatproof glass. The material used in the filter: it may feature a plastic or metal mesh. Metal is a more reliable and eco-friendly material than plastic. The French press designs are mostly constructed with materials such as – Steel, Glass, Plastic and Ceramic. Assembly and package: it is better to buy a coffee maker that is easy to disassemble, so you can rinse every little part of it. It will be great if there is a spare pot in the pack.